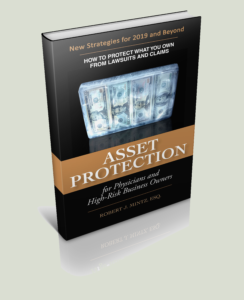 by Robert J. Mintz JD, LLM The most powerful and creative asset protection strategies with up-to-date legal developments including the latest planning techniques, case law, articles, illustrations and examples. Essential reading for every professional, business owner and potential deep-pocket lawsuit defendant. or Download and provides a comprehensive discussion of the latest cases and strategies in Asset Protection Planning. Lawyers search for a defendant who can pay. That’s the key element of every case. Without a defendant who can pay a claim, a lawsuit will not typically go forward. How does a potential plaintiff find out whether you have enough money to make you an attractive lawsuit target? Using a network of information services and techniques such as pretext, a detailed list and description of your assets and income can be assembled quickly. In this chapter we discuss the real story about what happens in a typical lawsuit from filing the complaint through the collection process. What motivates the attorneys on each side of the case and how you can avoid ending up in the middle. Although the law favors and encourages asset protection in most circumstances, there comes a point in financial transactions and legal proceedings when it is no longer permitted. In some cases this boundary is clearly defined, but often the question of when the remedy of asset protection is still permissible is fuzzy. The first consideration in structuring a sound asset protection plan is deciding which form of entity should be used to operate your business. The possible choices include general and limited partnerships, sole proprietorships, trusts, limited liability companies, and corporations. The Family Limited Partnership (FLP) is a prominent strategy for asset protection and estate planning. In this Chapter we discuss the advantages and disadvantages of the FLP along with the most recent cases and legislation. We analyze both charging orders and foreclosures against partnership interests and discuss in detail the options for holding partnership interests. The entity known as a trust will be essential in creating various strategies for accomplishing asset protection, estate planning, and privacy benefits. This chapter will provide a background for understanding how these techniques work and how a trust will be a part of your overall plan.